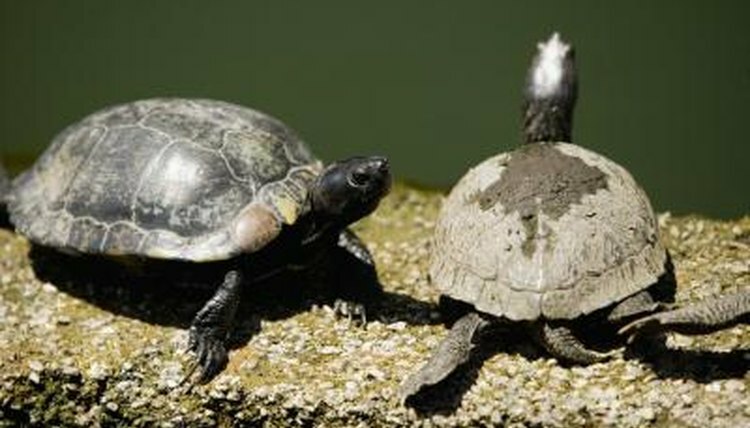 Many turtle basking platforms are available commercially, but enterprising hobbyists can build their own turtle rafts. Cork bark makes a great basking platform, as it provides the turtles with good traction, looks great and—most importantly—floats readily. Because cork bark is somewhat compressible, you can cut it so that it wedges securely into place. Alternatively, you can use suction cups to it to keep it from drifting around the aquarium. Measure the inside width of your turtle’s aquarium using the tape measure; this will determine how wide the cork bark section will be. Decide how long you want the raft to be; this will determine the length of the cork bark. It should be at least one and a half times as long as your turtle. Mark the dimensions of the platform on the back side of the cork bark, using the tape measure and the nontoxic marker. In other words, if your turtle’s aquarium is 12 inches wide, and you want the raft to be 10 inches long, you should draw a rectangle 12 inches by 10 inches. Cut the rectangle out of the cork bark using the utility knife or hacksaw. If you wish to wedge the cork bark into place, cut along the outside edge of the drawn lines. If you plan to use suction cups to keep the platform in place, cut along the inside edge so that the resulting raft is actually slightly smaller than your measurements; this will allow the raft to move slightly to accommodate water level fluctuation. Poke small holes with the screwdriver along one of the edges of the cork bark—preferably an edge that does not face the front viewing area. Place a small amount of aquarium silicone in the holes. Press the tabs on the suction cups into the holes in the cork bark. Set the raft aside for several hours until the silicone has dried. Place the cork bark raft inside the aquarium. Attach the suction cups to the glass so that the raft does not scoot away when the turtles try to climb on.  Be sure to place the basking platform under the heat lamp so your turtle can warm himself. ⚠ If you choose to cut the bark to fit the aquarium snugly, be careful not to force it into place, which can cause your aquarium's glass to break. Trim the cork bark if necessary to prevent placing undue force on the glass. Should I Have Pebbles in My Turtle Tank? How Much Gravel and Rocks Should I Put in My Turtle Tank?